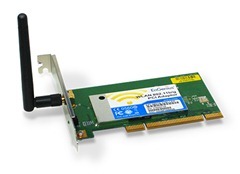 EPI-3601S is compliant to IEEE802.11b/g PCI card which adopts “Super G” and “Extended Range” WLAN technologies, enhance the transmission speeds up to 108M,extend 6 times distance than the normal 11b, 11g products. It provides multi security protection. Complying with 64/128/152-bit WEP Encryption, WPA, IEEE802.1x, TKIP and AES, which provides super-safety data communication abilities. With its strong firewall, EPI-3601S features effective security to protect the wireless network from intruders. With the external antenna, it can fit different operation environments and let the user connect to the Wireless network easily. The EPI-3601S also supports seamlessroaming and is compatible with other 11b, 11g WLAN equipments.